The Golden-naped Weaver was formally described by Moriz Sassi, an Austrian zoologist. The Golden-naped Weaver was collected by Rudolf Grauer, an Austrian explorer and zoologist. Grauer, a lawyer by trade before becoming an explorer, conducted zoological investigations in British East Africa (present-day Uganda) in 1905 to collect big game, in German East Africa (Tanzania) in 1907, and in the Belgian Congo (1910-11). In December 1909 Grauer started his fourth expedition in central Africa. He travelled westward from Lake Victoria to DRCongo where he collected birds at many different localities. He collected 4 specimens of the Golden-naped Weaver, 3 from Beni-Mawambi and 1 from Ukaika. Early in 1911 he returned to Lake Victoria, having collected over 6000 specimens, including several types and some rare birds, in eastern DRC. Grauer's collection was sent to the Naturhistorisches Museum in Vienna. It took Sassi from 1912 to 1924 to work through the collections, which were published in 3 parts. 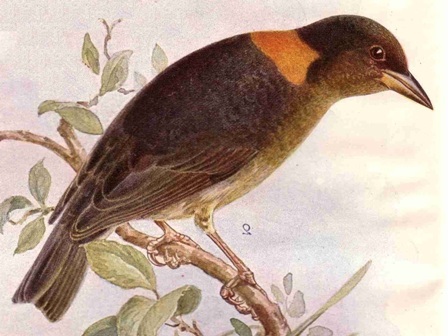 The Golden-naped Weaver was first illustrated by Gyldenstolpe 1924a, and the second illustration was much later, by Chapin 1954a. Ploceus aureonucha	Sassi 1920a,	Orn. Monatsb. 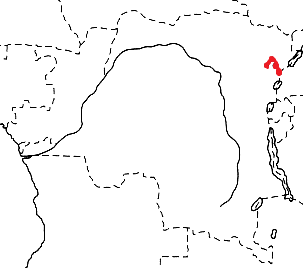 28 p.81,	Mawambi, Belgian Congo. aureonucha, Latin: aureus, golden; Med. Latin: nucha, the nape (Arabic nukha, spinal marrow). The types are in the Vienna Museum of Natural History. Identification. The Golden-naped Weaver Ploceus aureonucha is a rare but striking bird. The male is black with a deep red-brown crown, orange hindcrown, yellow hind-collar and line down the back, a deep maroon breast, and whitish undertail-coverts. 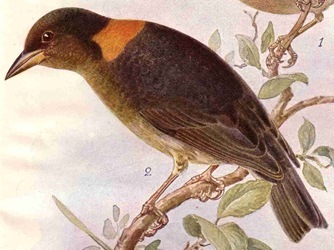 The similar Yellow-mantled Weaver has a yellow hind-collar but the rest of the upperparts are black, the breast and belly are chestnut, and undertail-coverts black. The eye is dark in the Golden-naped Weaver, in contrast to the pale eye in the Yellow-legged Weaver and Vieillot's Black Weaver. The female Golden-naped Weaver is black above with a rufous crown, dull yellow hind-collar, and underparts grading from charcoal on the throat to whitish on the undertail-coverts. 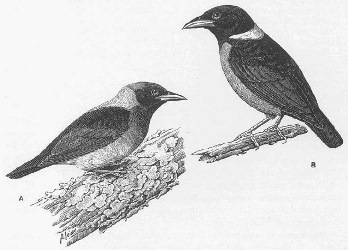 The juvenile is similar to the female but with the crown washed brown and no hind-collar. Distribution. 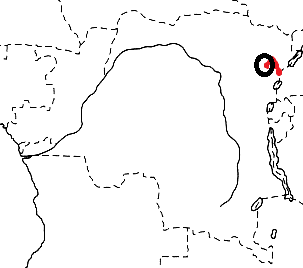 The Golden-naped Weaver has a restricted range and was known only from Ituri forest, DRCongo (see map right, based on Birds of Africa). No subspecies are recognised. Due to the limited number of records, it has been considered as a hybrid, but a recent molecular analysis by Michel Louette indicates that it is a distinct species (see here). Since 2006 it has also been recorded in extreme western Uganda. A list of sight records is provided here. Habitat. The Golden-naped Weaver inhabits the canopy of dense lowland primary rainforest. It also occurs at forest edges and in tall trees above old secondary growth. Food. Fruit and insects have been found in the stomachs of specimens. Flocks feed in the forest canopy by gleaning. Breeding. The nest and eggs of the Golden-naped Weaver are still undescribed.